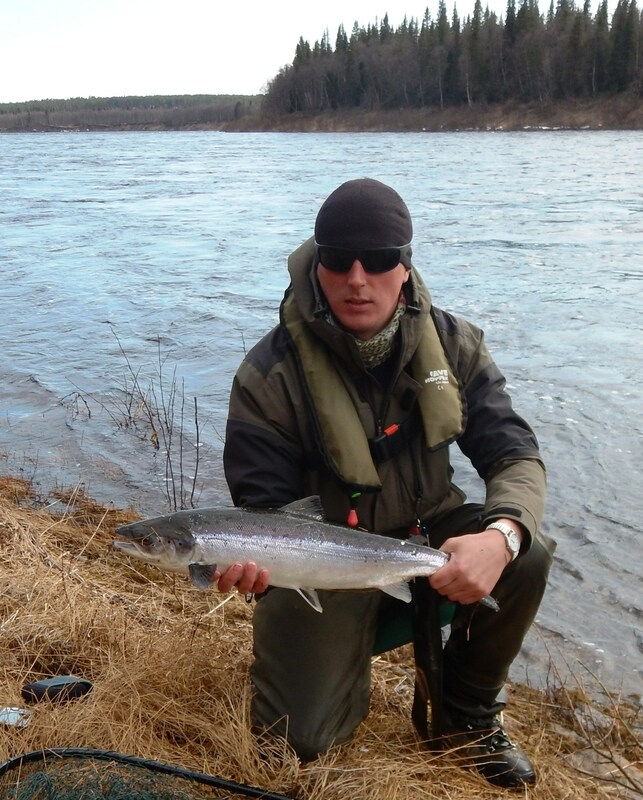 A picture of me with a better than average Varzuga River salmon. Looking across the Varzuga at Roxton’s lower river camps. A very nice facility. 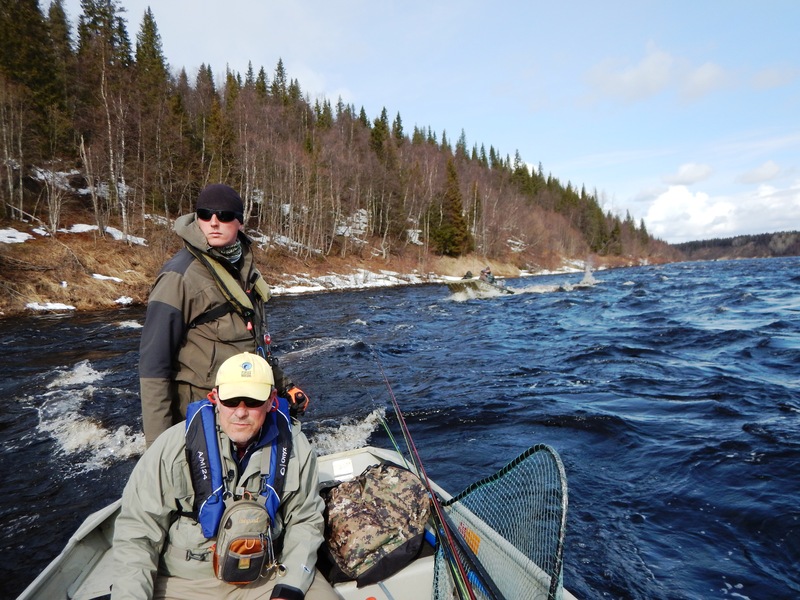 On 5/24 a Boston area friend, Ralph Vitale, and I left to fish the Varzuga and Kitsa Rivers on the Kola Peninsula in Russia. We booked the trip last fall with Roxton’s Outfitters of England. I had gotten great reports from fellow posters on the Salmon Forum chatroom in the U.K. about Roxton’s. 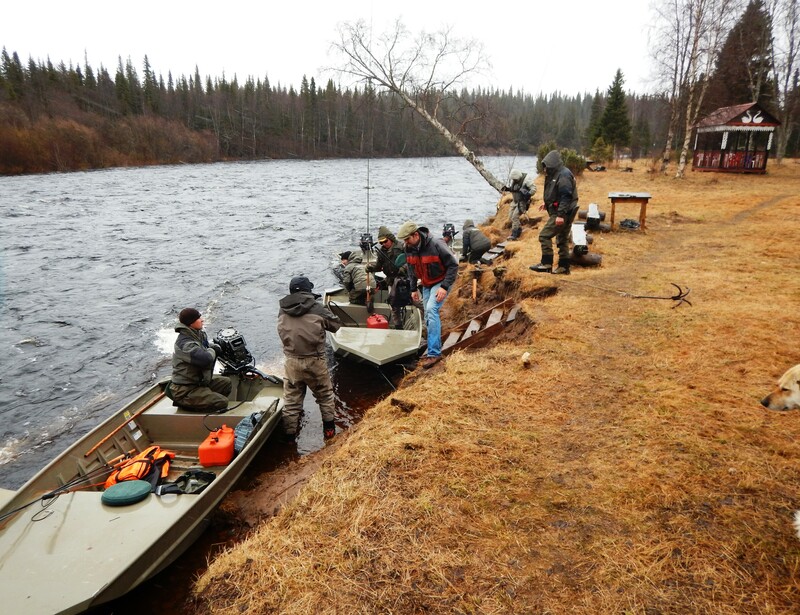 They have managed the Varzuga River salmon fishing for nearly 30 years. 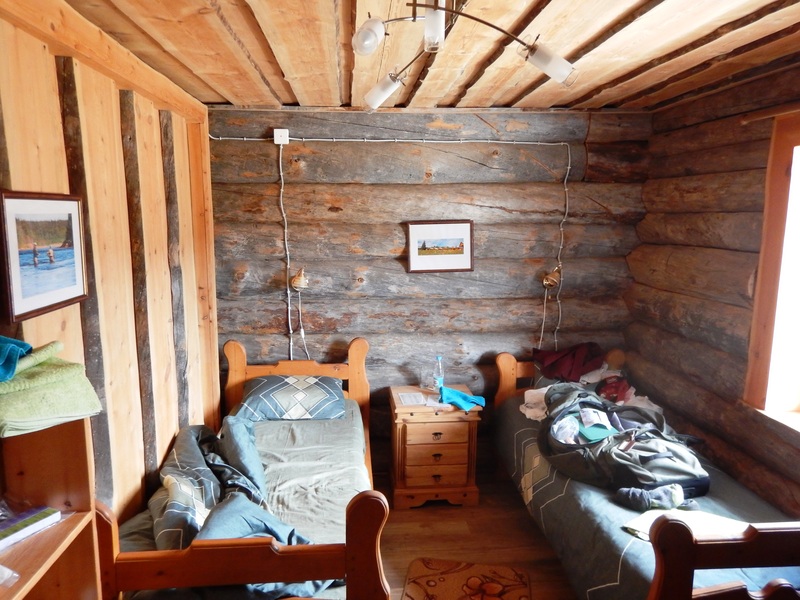 My room at lower Varzuga camp. 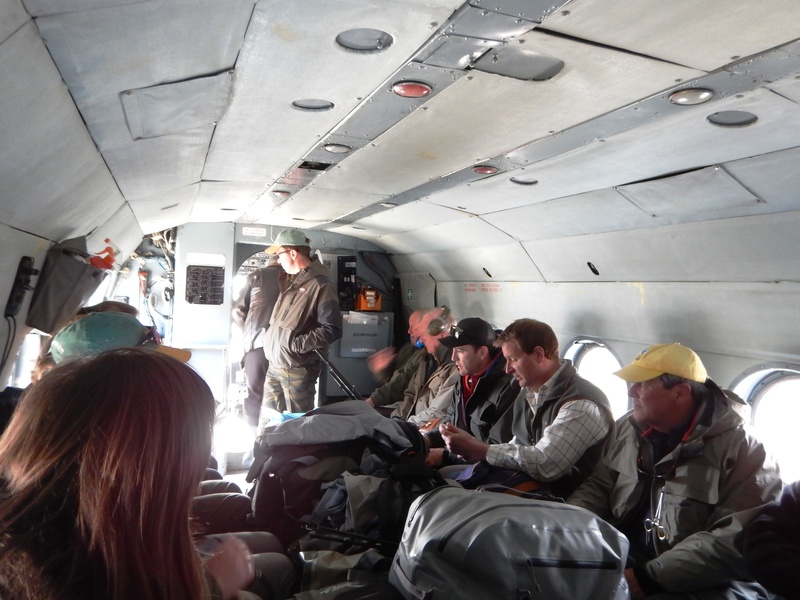 Standard practice for fishing the various salmon rivers of Russia’s Kola Peninsula is to board a chartered air flight that most of the other outfitters also use. This flight between Helsinki, Finland and Murmansk, Russia runs once a week during the Kola salmon season. Missing this charter is to be avoided as commercial air travel over the route is apparently non-existent, and the alternative is a two day drive in a junk car from St. Petersburg, Russia over unimproved dirt roads, through uninhabited sub-arctic hinterlands. This prospect caused us to leave a day early and spend it as tourists in Helsinki. In Helsinki we visited a Finnish salmon fly shop and took in the city’s attractive waterfront. Dinner that evening back at the hotel was a reunion for many who regularly take these Russian salmon fishing trips. The gathering included people going to fish the other rivers on the peninsula since all the outfitters cooperate on this charter. A fisherman from Seattle got my vote for the longest trip; he was headed for the Atlantic Salmon Reserve with Norwegian salmon guru Mikael Frodin. The plane was a bit light, though, as the weather – that you will soon hear about – had caused a number of rivers to cancel the week’s fishing. 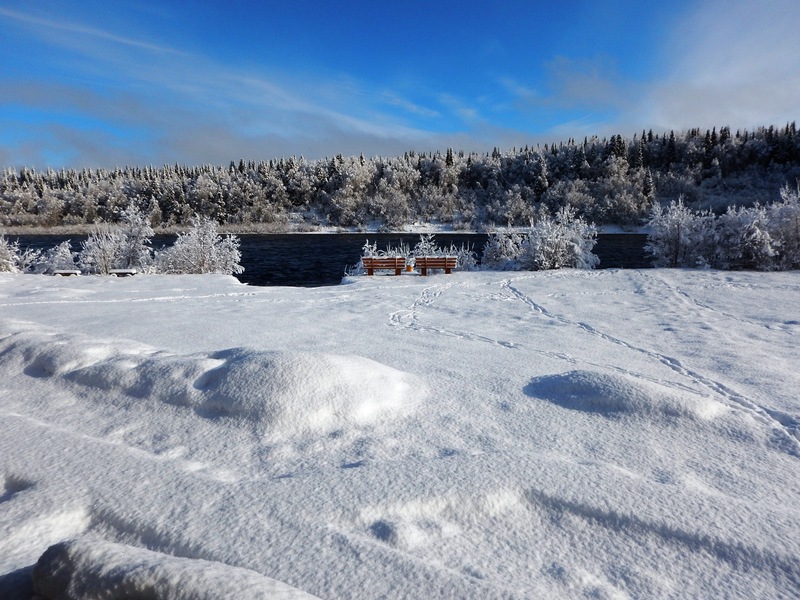 This was supposed to have been the third week in Roxton’s Varzuga schedule, but for their first time since operating on the Kola both weeks were canceled due to the extreme cold conditions that left the river essentially frozen during the first week and only partially open the second. We picked the Varzuga because of its reputation for a highly prolific and reliable early run that would allow us not to miss any of the Miramichi fishing. Roxton’s lower camp near the mouth of the Varzuga is about 250 miles south of Murmansk, and it is reached by flying in a Soviet military style helicopter that carried in about 20 of us along with all of our gear and supplies for the camp. Inside helicopter on way to Kitsa from Lower Varzuga mid week. Charlie White, Roxton’s director of fishing sits just to the left of Ralph Vitale in the yellow hat. It was quite an experience, and a great way to see the vast, wild, Kola landscape because the helicopter’s cruising altitude and speed are both substantially more viewer friendly than regular airplane travel. The Varzuga has a smaller sister river called the Kitsa with which it shares a common estuary. 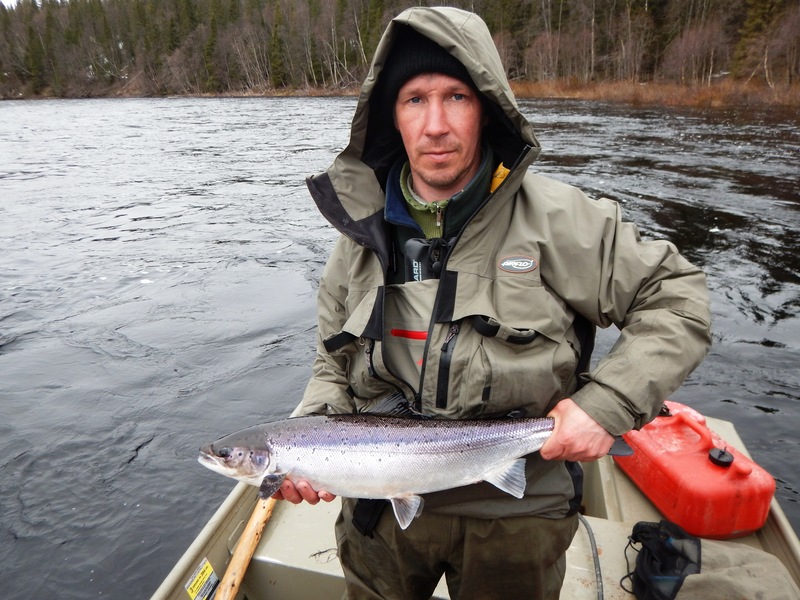 Our trip included 3 days on the Kitsa and 3 on the lower Varzuga, with a mid-week transfer by helicopter. 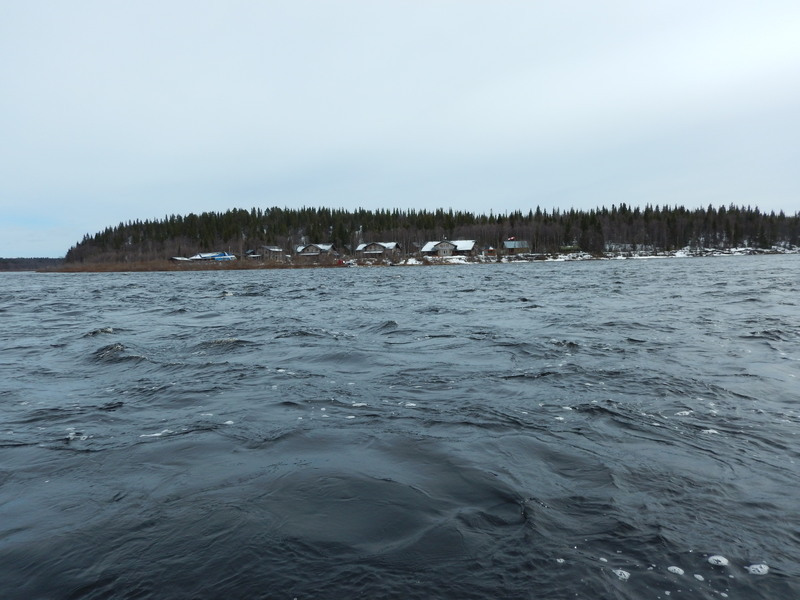 It was very much like the Southwest and Northwest branches of the Miramichi system, and the landscape as you can see in the pictures looked quite similar too. 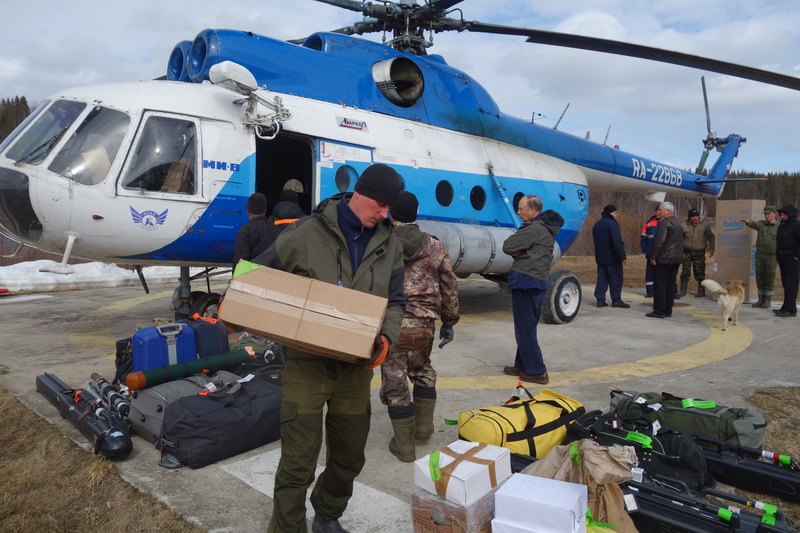 Guide Sergei at Lower Varzuga unloading helicopter arriving from Murmansk. Ice coming down Varzuga with the village in the background. Ralph, myself and seven other fishermen, all from the UK, began our week with the Varzuga leg of the trip. It was cold, record cold. Temperatures during the day were just above 0C compared to their normal average daily highs for June 1 of about 10C. For Fahrenheit users that is the difference between 32F and 50F. One is pleasant and fishable the other essentially unbearable. 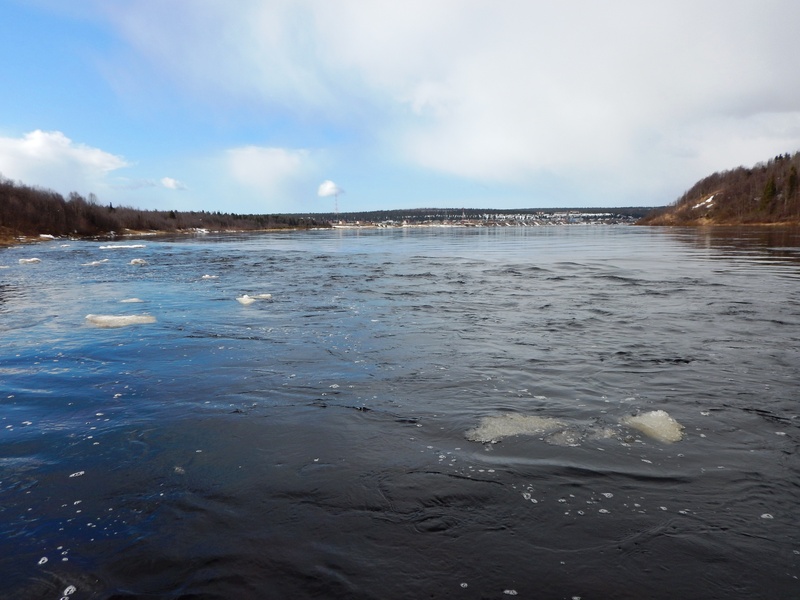 When we began fishing on Saturday 5/27 there were still ice cakes coming down the river, and we had to be constantly on watch not to have our numb legs swept out from under us by one. These disappeared by mid-week and we saw none on the Kitsa, but water temps still never got above 3C all week! In fact on the Kitsa air and water temps were both 1C at the end of our trip, and with the air about the same plus a two-day snow, sleet and rain storm, several anglers chose not to even fish the last couple of days. Still with all this going against them the salmon run was building. I definitely found more fish on the Kitsa at the end of our trip, and our sister group over on the Varzuga had moderately good fishing during that same period. I had 10 salmon for 6 days of fishing which is just a fraction of the normal 40 or so averaged on this trip, but it was still reasonable Atlantic salmon fishing by any other standards. The fish were essentially all straight out of the Baltic and brilliant blue and chrome. Though the Varzuga system is not noted for big fish they fought like demons. I got one somewhat larger fish that was slightly colored and the guide said this was an “ice fish” part of a run that enters the river under the ice during the winter season. Wading was a little better on the lower Varzuga. Kitsa camp manager Jack Selby organizing guides. In spite of the very high and freezing water we did about half and half wading and boat fishing. Normally these rivers are fished predominately by wading. The boats are special metal boats made to run with jet outboard engines. The Russian guides we had knew their rivers, and were very skilled at running the jet boats in the challenging conditions. Food was very good, accommodations were comfortable, and beer, vodka and wine were available at no cost. Combining the free alcohol with the unusually bad weather made for long cocktail and dinner hours back at camp. 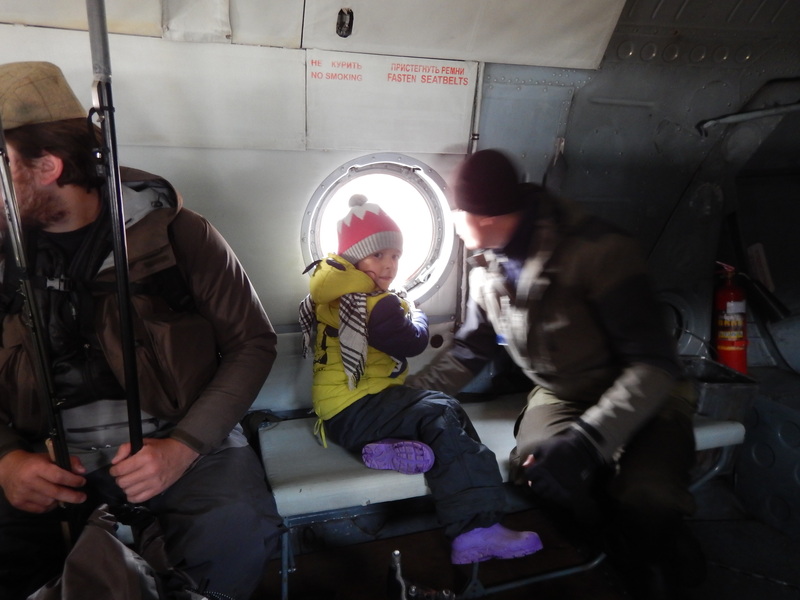 Guide Sergei and his daughter on way to Kitsa camp to help move in. Our guide on the Kitsa kept Ralph’s grayling for dinner. 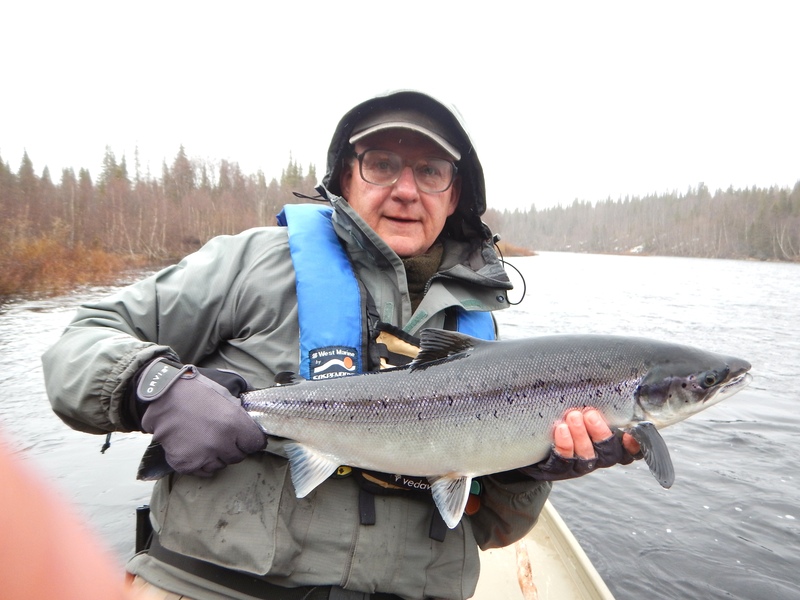 Servei, our guide on the Kitsa – both guides were named Sergei – holds a bright salmon from 34F water. The air was probably around 36 to 37F. Midnight June 1 at Kitsa. The Atlantic Salmon Federation just released its annual status of the stocks report, and the result showed a decline in overall Atlantic salmon population from 2015 to 2016. The numbers of larger salmon in 2016 declined only marginally, and are still at the third highest annual level since the early 1990s, but grilse numbers are way off, and this is particularly concerning because it is the future. 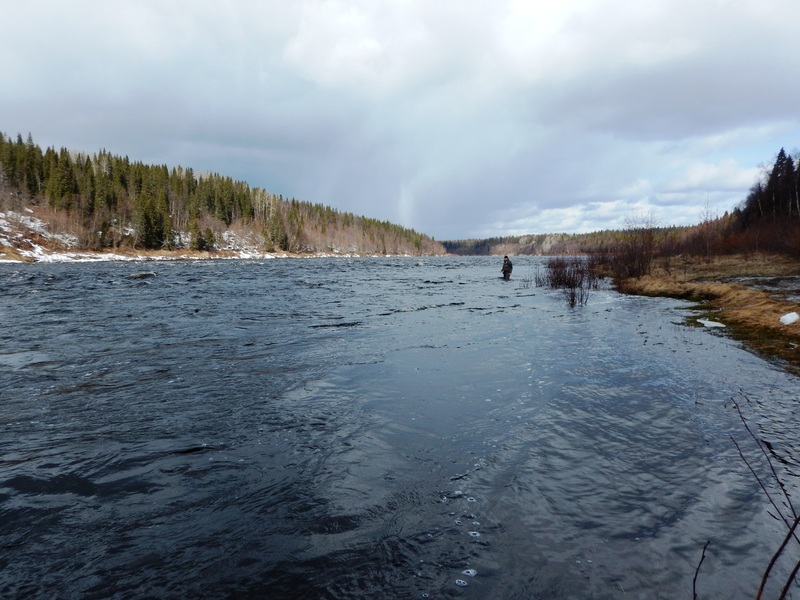 On the Miramichi system the Northwest was at 84% of the number of salmon required to fully seed the river while the Main Southwest achieved a decent 107%. Clearly the issue is sea winter survival, and until we can isolate and cure the issue/s that are causing the mortality we need to kill as few Atlantic salmon as possible. Certainly all net fisheries including the ones at Greenland and Saint Pierre Miquelan, as well as First Nations food fisheries need to be severely curtailed or better still ended. On the Miramichi everything is ready for the season to begin, and with a few bright salmon having been caught on the Northwest it really already has. My first trip is next week, and right now water height is a good 1.35 meters and the temperature is fluctuating in the 50s – right where it should be. There is a little rain and warmer weather forecast – all good! I’m psyched up to get going. Most of the fish that are caught in June are larger salmon. In fact the percentage of repeat spawners in the early run is the highest of the season, and every one of these fish is a prime condition silver bullet with incredible speed and endurance. Most of the lodges are lightly book at this time since many anglers want the larger numbers of fish available beginning in early July, but for me June on the Miramichi simply cannot be missed. The Miramichi Salmon Association needs your help. 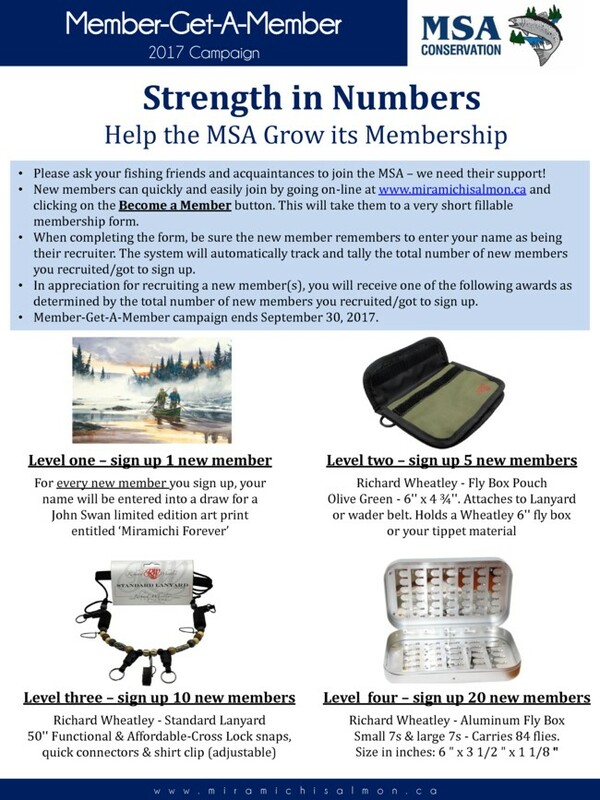 I’m a strong believer in the MSA and what it does. In addition to the advocacy and scientific work this organization rolls up its sleeves and stocks fry in needy sections of the river, rips out beaver dams, identifies cold water refuges in the river and secures grants to clear out and enhance these cold streams, plus much more… Right now we are holding our annual member get a member drive. Everything that you need to do is explained below. As I did last year if you join and name me, Brad Burns, as being the recruiter I will enter all the new members who did so in a drawing and pull from those names the winners of whatever prizes we win. If you convince some of your friends to join and name you as the recruiter you will also have another chance to win one of the prizes. That is all completely up to you, but please join in any case and help give the MSA the strength to stand up our salmon. (The link in the graphics below doesn’t work but there is one to the Become A Member page at the beginning of this pargraph. Brad, just off to the Spey where I am told fishing is good after shed loads of rain. Hope it stays dry for the next few days . I am going to make good use of my BonBon fly tied by CURTIS Flyshop . Its a a Quebec pattern so they won,t have seen many on the Spey. 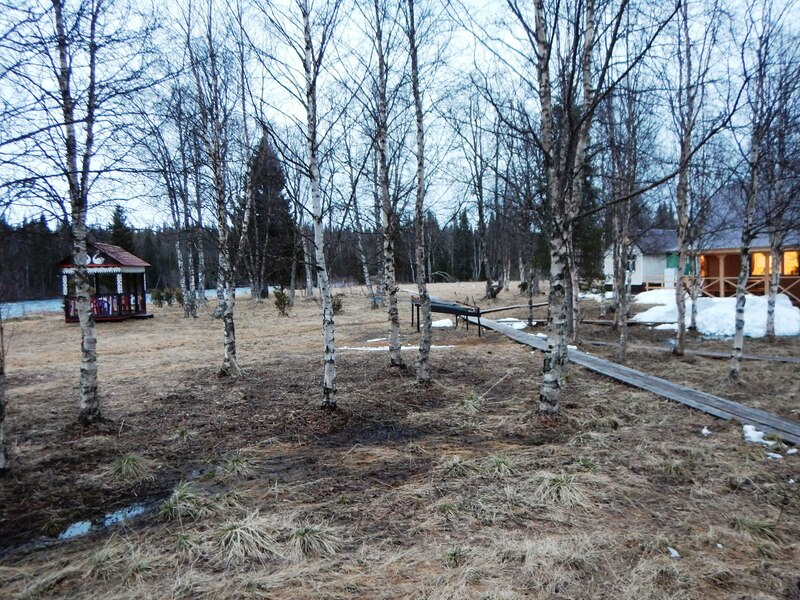 Sounds as if the Varzuga trip was quite an ordeal- I have been to the Pana camp( Varzuga) for ten consecutive years until three years ago and never had your sort of conditions – in fact it was sometimes shorts. Atleast you had a few fish presumably on sunk lines and big flies. Chris – the folks at Pana – all of them – were skunked completely! Yes, our fish were caught on heavy sink tip lines and large, metal tubes. I used a 15′ 10-weight the whole trip. I only packed those big rods at the end because I was afraid these might be the conditions.